Below are a small selection of projects that I’ve been lucky enough to work on over the last year. Appointed to the business in 2014, this campaign constitutes the first of a series of initiatives created to inspire exploration and satiate the exploratory mind. We followed three modern-day explorers through the Nordic wilderness, each inspired by Friluftsliv (the philosophy of man + nature). Their actions were captured on film as genuine reportage, providing source material for all Canada Goose communications in the Nordics. Taking us from the urban streets of Copenhagen, to the forests of Northern Sweden and out to the Arctic sea, these authentic stories celebrate and explore man’s connection to nature. A full suite of AV and static assets showcased the exploration triptych. We uncovered that house-movers have a latent empathy with homeless people – making them a perfect audience for the UK’s leading youth homeless charity. But the charity market is so competitive that fundraising wouldn’t work – we needed a sustainable commercial proposition. When winter draws in and there’s no place else to go, it’s the cardboard box that helps to protect a young homeless person from the elements. 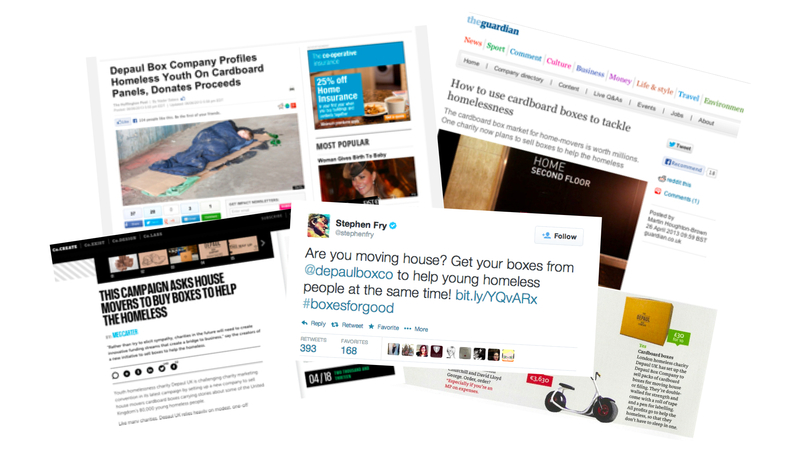 And it’s cardboard boxes that home-movers need to transport things from one home to the next. 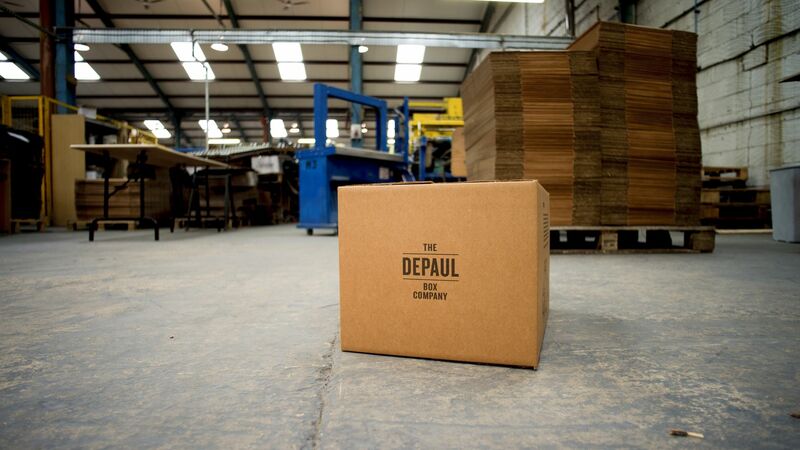 We founded the Depaul Box Company to sell cardboard boxes to people who are moving house. 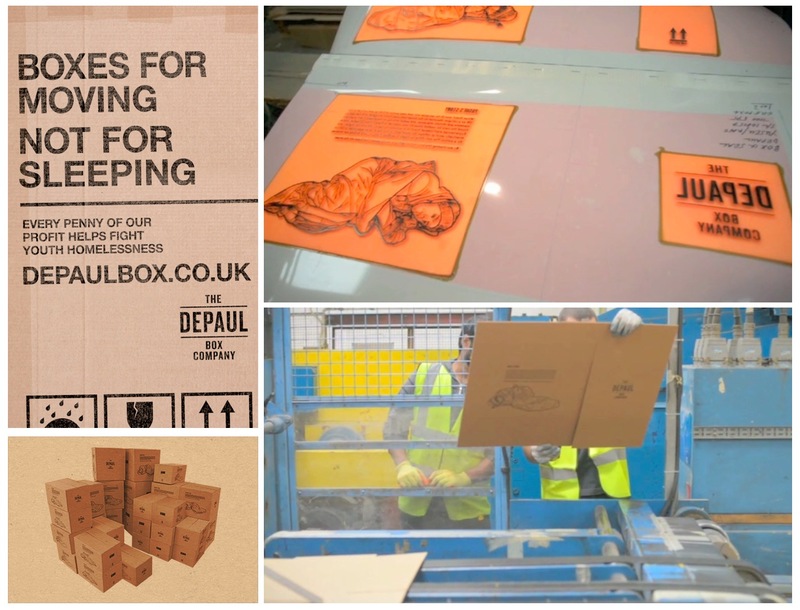 They’re just like other boxes – a parity product in a highly commoditised marketplace, except for one big difference: all of the profit goes to helping young homeless people. Written about by many influential media sources; from the Financial Times to Stephen Fry. But best of all, over 350 beds provided for young homeless people. One of the hardest parts of homelessness is that you become invisible to society. The personal stories of the individuals are forgotten and they blend into the surroundings. Before long, homeless people aren’t seen as people at all. By finding a way of sharing the personal stories of homeless people, we believed we could help shift the perception of homelessness in the UK. 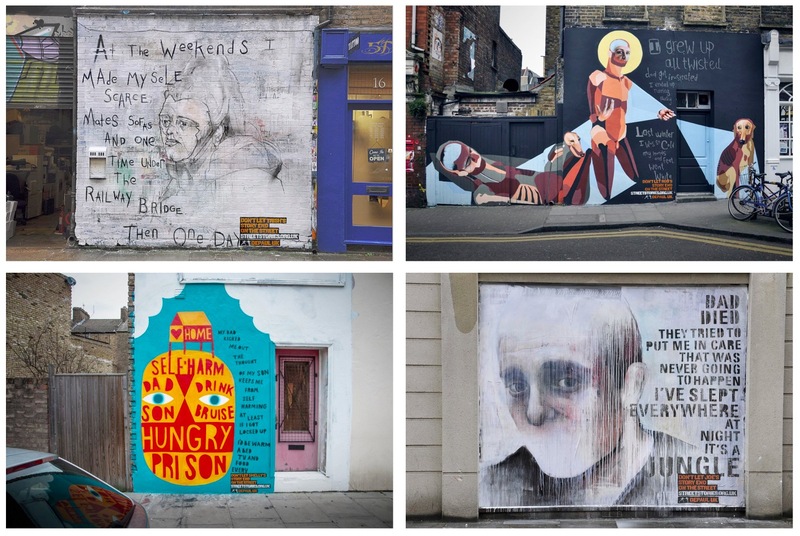 We worked with five of the best up and coming street artists to create murals documenting the lives of young homeless people around London. In each piece, the copy explains the brutal realities of how that person ended up on the street and the emotional journey they’ve been on. 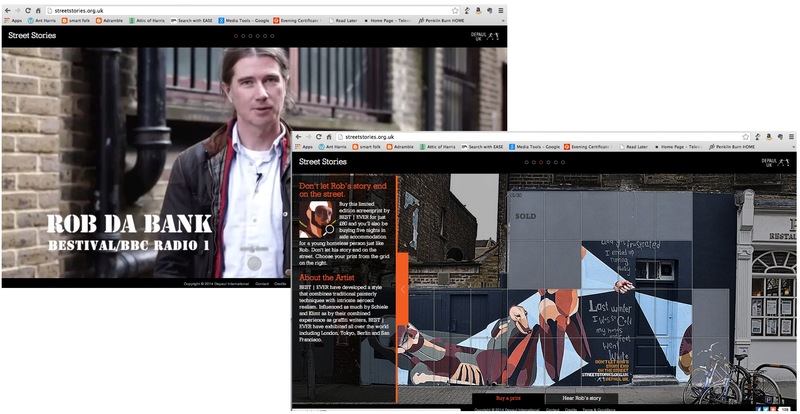 Through our website, the public were invited to buy off sections of the digital walls – symbolically removing part of a homeless person’s story from the street. With each purchase, our customers not only received a limited edition screen print, they paid for a young person to have a bed for two nights. Thousands of people heard the forgotten stories of young homeless people. News coverage, including primetime BBC television news. The art of course, is as vulnerable to the outdoors as the young people it has been created to help. Whilst they may not last, we’re sure their message will; nobody’s story should end on the street. Launching the Wild Atlantic Way, a 2,500km touring route down the west-coast of Ireland, wouldn’t be easy. Our audience long for a holiday that immerses them deep into new cultures, but it’s a position that many many competitors claim already. We decided that we had such faith in the Wild Atlantic Way as an immersive destination, we shouldn’t simply tell people, we should prove it. 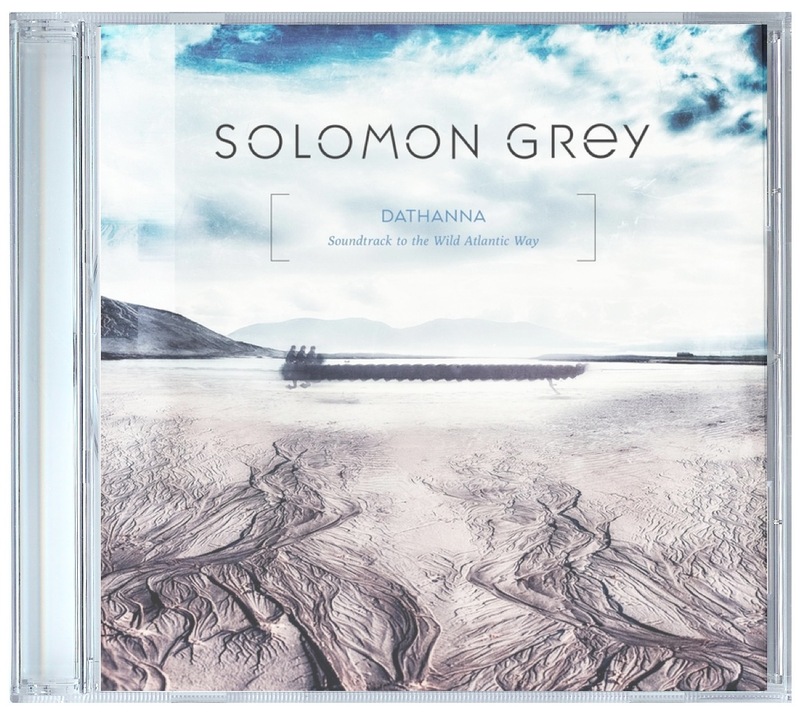 Along the journey, the band recorded an album – a physical artefact that provides tangible evidence of immersion. 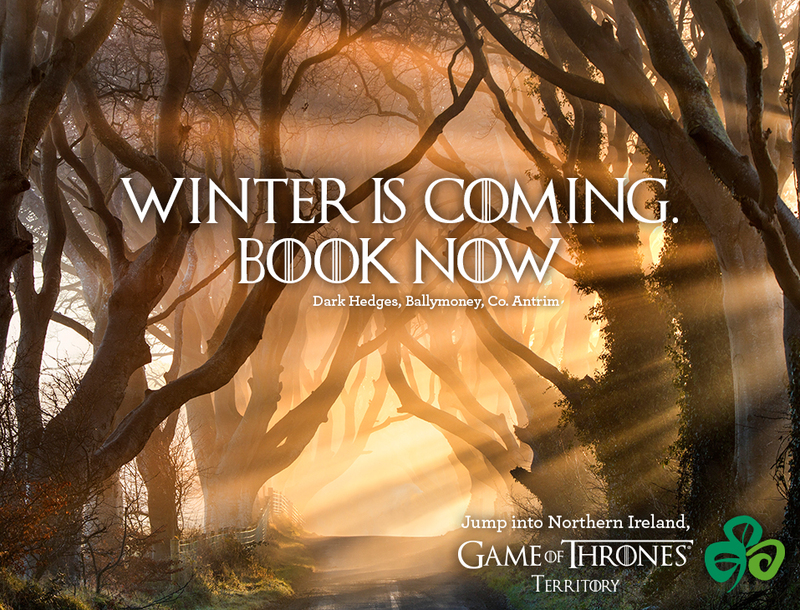 Game of Thrones has attracted a cult following over the past three seasons, and Ireland (where the majority of the series is filmed) has the perfect opportunity to leverage its popularity to boost visitor numbers. 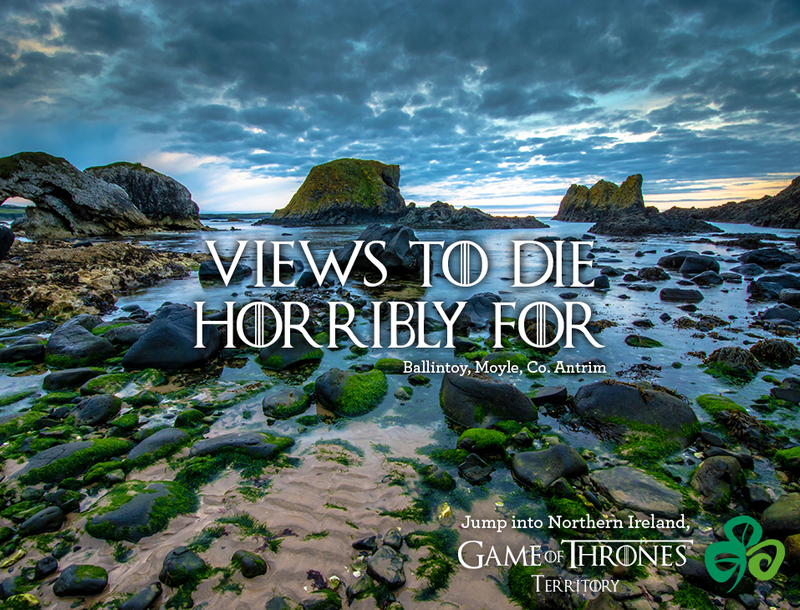 We decided all creative work should try to bridge the gap between fantasy and reality – bringing Game of Thrones to life for Tourism Ireland. 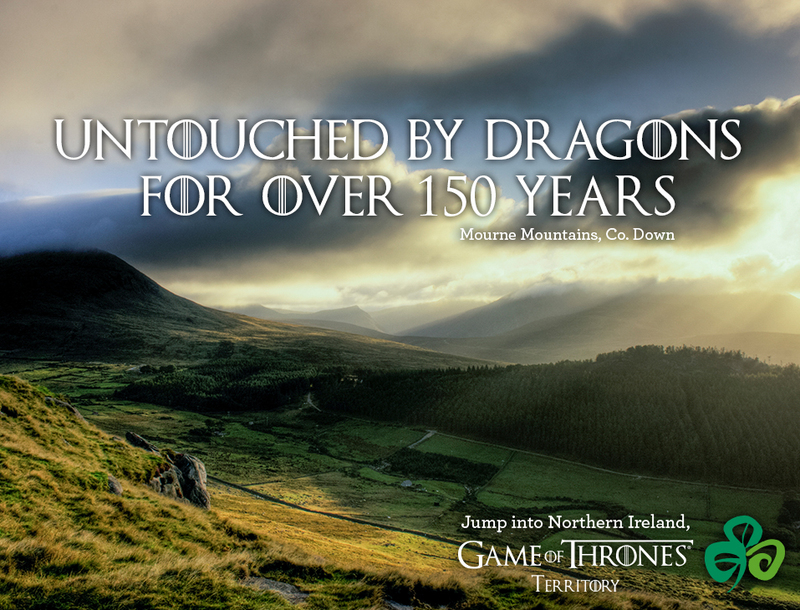 The creative juxtaposes beautiful Irish landscapes with ‘twisted’ tourism lines, in a Game of Thrones style font. “This approach is to be commended as it is important that we maximise the tourism potential that the new series will generate.” Enterprise Minister Arlene Foster. For our younger audience, a holiday isn’t about relaxation. They don’t want downtime, relaxation or lie ins. This audience want to ensure no moment of their holiday is wasted. 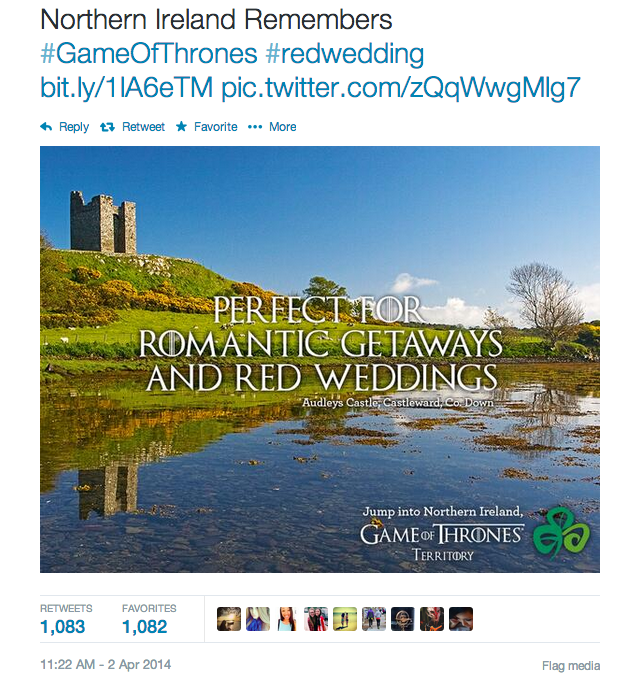 Unfortunately, this audience don’t think there’s all that much to experience in Ireland – and consequently it doesn’t sit at the top of their list of places to visit. We decided to develop creative that not only showcased the wide variety of experiences available in Dublin and Belfast, but played to the competitive spirit of our younger audience. Two challenges were created – Craic Dublin and Check Belfast – a list of 50 things that had to be completed for 48 hours. VOD creative was developed, driving visitors to ireland.com to take up the challenge and book a weekend trip to Dublin. 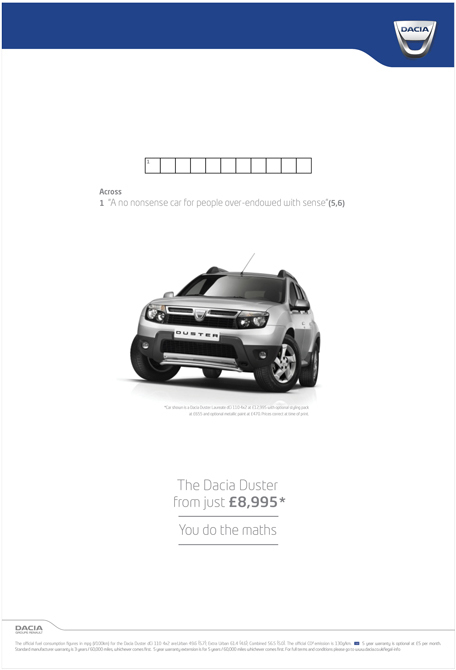 In 2012, nobody in the UK had heard of the Romanian car brand Dacia. We had a monster challenge ahead of us; launch a new car brand into a fiercely competitive market, with not a lot of money, from a standing start. We were every bit a challenger – and we needed an enemy. 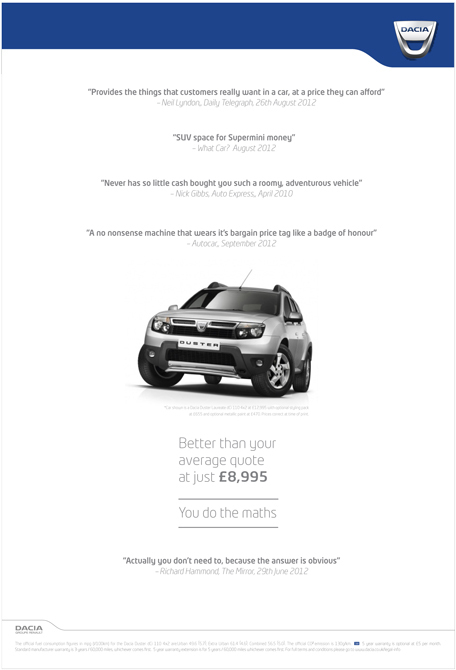 We decided to make an enemy of the unnecessary – racing stripes, red leather and optional extras. And by doing so, we framed ‘value’ as a mark of common sense. 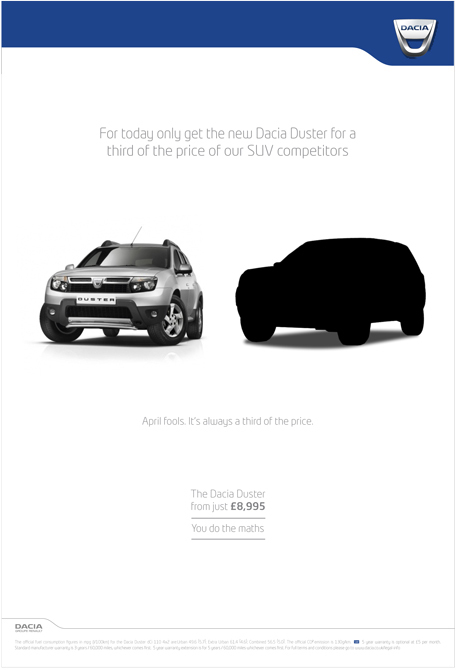 All creative ideas went to prove that Dacia favoured ‘function over frivolity.’ The work celebrated simplicity, and every piece finished with a common sense endline we were sure our buyers would use again and again; You Do The Maths. In the first year, sales in the UK went from a standing start to 17,000.